As I dressed for Sunday morning's IDPA match at Cavalier, I checked the weather app on my phone. The forecast was for cloudy skies, with temps in the upper 60's. Great, finally decent weather at a match. After a rainy match last month, followed by a wet and muddy Chesapeake Cup, and a match moved indoors, I was ready for some shooting on dry ground. Arriving at the range, it was quickly apparent that the prognosticators had once again gotten it wrong. Very wrong. The rain started about the time we began shooting and the temperature never made it out of the mid-50's. More than a few folks had not dressed for conditions, but at least I did have my rain jacket on hand. The first stage we shot while seated under cover, but the targets were all protected by the dreaded plastic bags. Starting with the loaded gun and all reloads on the table, we engaged the six targets in priority order. I shot just one point down on the stage, that one penalty being on one of the closest targets. To our delight the precipitation let up as the squads moved to their next stages, and the targets were uncovered. Our second stage began, for most, with a long run to the first point of cover. The shooter also had a choice to engage one target over a wall to begin the stage. From the first point of cover, a small shift exposed a lone more distant target, followed by another sprint back across the bay. From there, two points of cover with another small position shift between exposed the final four targets. It was a fun stage that tested settling quickly into a stable position after a quick run to position. Our third stage started out with the shooter holding a tool bag in the strong side hand, which was dropped at the start signal. Three target arrays were to be shot from three shooting positions. There were some precariously place non-threats among the targets. Cover and target positioning added further to the challenge as shots required a pretty tight lean to the right side. The last two stages we shot were combined on one bay and shooters alternated shooting. After shooting the first, you'd reload your magazines while the previous shooter shot the second, after which you'd shoot. We were up against the rain returning so the SO's kept us straight and moving quickly along. The first stage of the pair started with the gun downloaded to six rounds. After emptying the gun on the first, up close target, we moved to two more positions in the course where we engaged a couple more target pairs. Adding to the challenge, there was a non-threat behind one of the targets. One had to be careful of the shot angle and placement, since shoot-through hits on the non-threat are also penalized. For the final stage, our unloaded gun was set in an open gun safe, with our magazines on the table. Retrieving the gun, we loaded it and engaged two reduced area targets right in front us. Then grabbing a magazine, we advanced to either side of some barrels to find some close but hidden targets on either side. 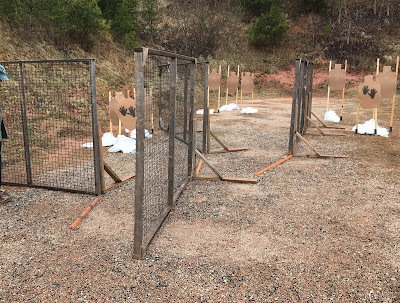 The targets were shot around the non-threats and between the barrels. This stage could be shot fast, but still had to be shot carefully. While I didn't notice anyone getting hits on the non-threats, I saw a few shots go through the barrels as well as -1 hits on all the targets. 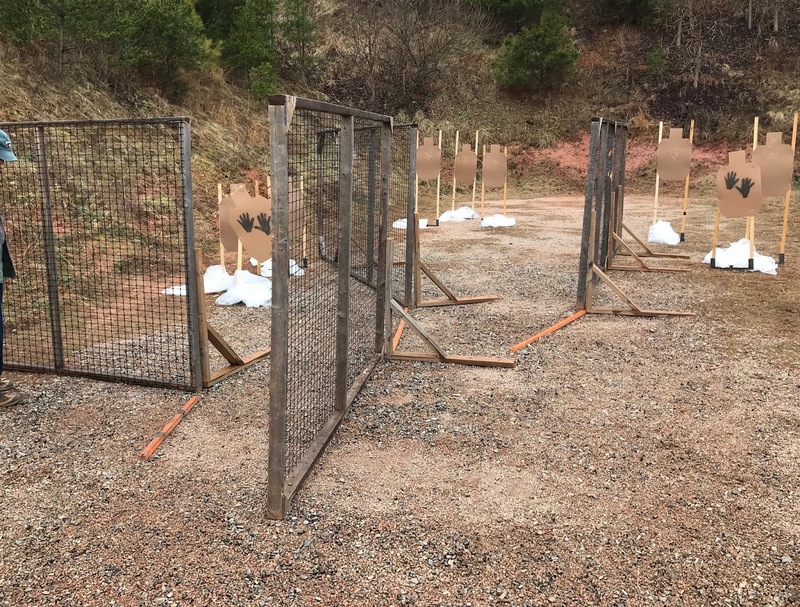 Some shooters opted to empty their first magazine by firing five shots at each of the first two target, and even that didn't always guarantee a -0 score. I think the stage was deceptive in it's simplicity. I opted for aimed head shots on the opening two targets, and also finished the stage with zero points down. We finished shooting and broke down the match before the next batch of rain came in force, though it did sprinkle a bit. The match provided five quite fun stages. They were challenging, with interesting non-threat placement throughout. My shooting throughout the match, while accurate felt a little "rough" to me. It didn't seem, to my mind, that I was moving quickly or getting in smooth transitions. That said, I was still happy with my scores. While just 10th of 43 overall, I place well within my division and classification finishing 1st of 9 in SSP SS. But it's really all about the fun, and I certainly had that. Due to work and family obligations I hadn't been able to practice at all the week before. No dry fire, no live fire, and I didn't even handle the gun to clean it. I was certainly ready for some time spent shooting. I'm looking forward to actually shooting under sunny skies some day soon.